The days of only wearing a classic veil in your hair for brides are over. These days, anything goes! 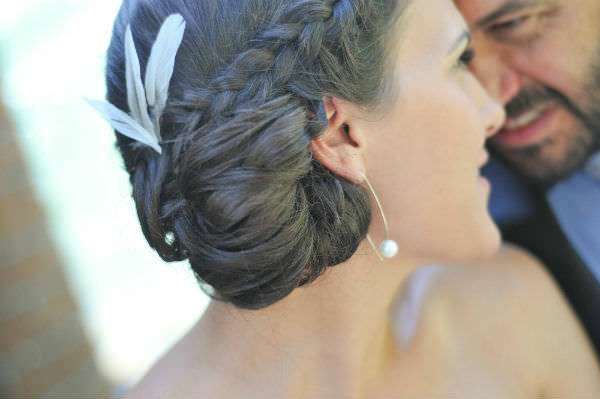 Whether you do something creative, quirky, sentimental or classic, here are ten bridal hair accessory ideas that are sure to inspire you. A medium to small sized decorative clasp, usually made of metal. Brooches tend to be heavy, so it’s best to put them in hairstyles that have at least some hair pinned with some sort of structure. Place your brooch somewhere where it can rest against something for support. Whether it’s up against an updo or just some bobby pins, it needs something to support the weight. If your broach has a clip on the back instead of a comb, keep the pin closed and put bobby pins through the clip to hold it in place. A veil made of Russian netting, fastened to a decorative clip that is shaped to frame your face. Birdcage veils add a lot of interest around the face. Keep the hair around your face simple so it doesn’t look too busy. They also compliment vintage styles well. 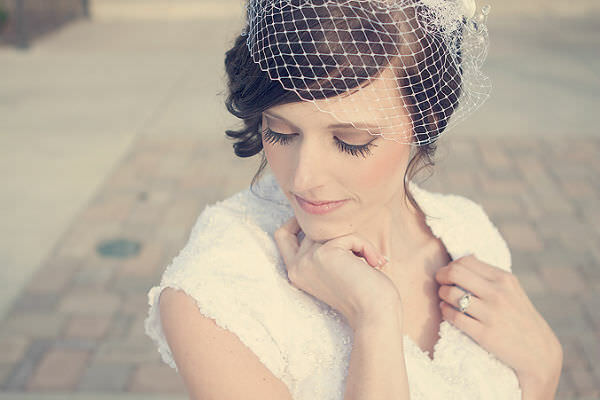 Birdcage veils look most flattering when placed on a slight diagonal, barely grazing or covering one eye. Some birdcage veils can be really poofy. Hide bobby pins on top of your head to help flatten down the top a bit. A band worn around the head. It can be thick or thin, and made of fabric or metal. 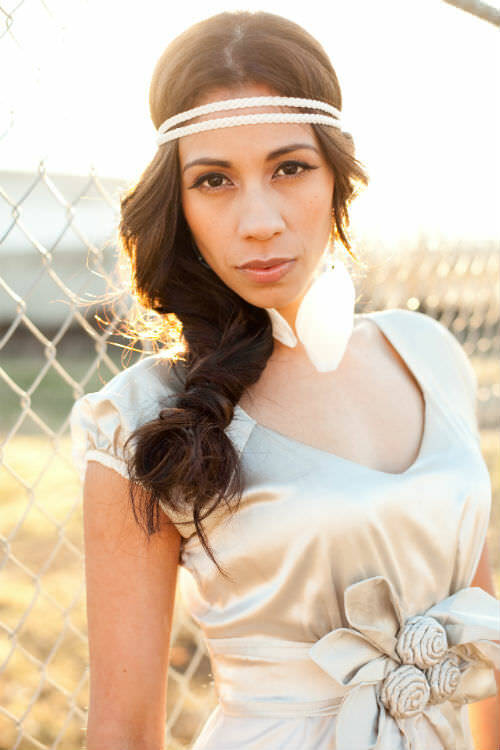 If you are wearing the headband across your forehead, it will look best with mostly down or all down hairstyles. If you are wearing it across the top of your head, it can go with any bridal hairstyle. 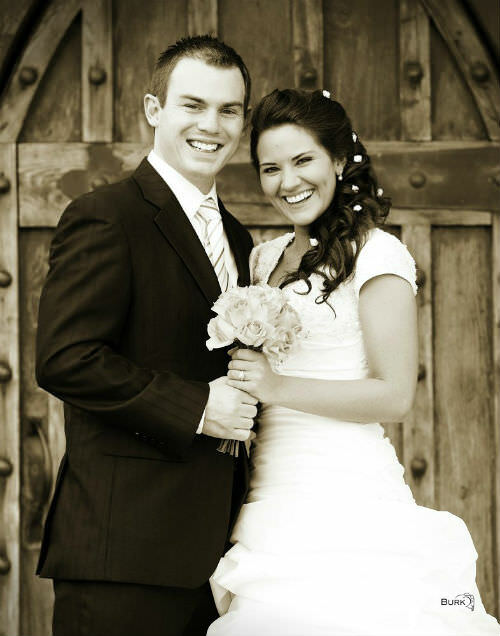 Headbands can be worn across the top of the head or across the forehead, as seen on this bride. If your headband forms a complete circle, cut the back and secure both sides with bobby pins rather then trying to work a full headband into your hairstyle. Small flowers of any color placed sporadically throughout a hairstyle. Small flowers look best in curly hairstyles. They can look too prominent and out of place in sleek styles. When placing little flowers in your hair, use the mirror to place them where they are most visually pleasing. Avoid putting too many in one spot and try to space them evenly. If possible, get flowers with little stems. Flowers with stems are a lot easier to secure in hair. Fall or spring leaves of different colors and varieties. Leaves will look best in natural looking hairstyles. Whether you wear your hair up or down, keep it soft and natural so the leaves compliment your look. In down styles, place the leaves on the side by either ear. For half up and upstyles, place them close to your updo, slightly off center. Place the bobby pins around the stems rather then through the actual leaves. A piece of opaque fabric attached to a small clip and worn in the hair. 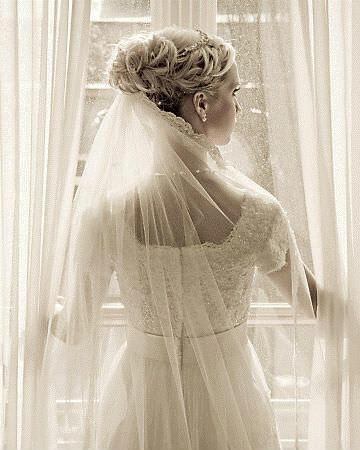 Veils can be long, short, made of different fabrics, and decorative or plain. Veils go best with down, half up or all up hairstyles. If you are doing a side updo, wear the veil higher up in the back, almost to your crown, rather then down low or to the side. 3. On top at the crown of your head. Most veils have a comb. When putting the comb in, make sure the round of the comb follows the round of your head so you don’t put it in backwards on accident. Real or fake white feathers are placed together in a hairstyle to mimic the shape of a hair accessory. Feathers are small and delicate enough to compliment any style. If you are going to use larger feathers, make sure to add enough body to your style to balance the look. Avoid placing your feathers too high up on your head, otherwise they will stick up past your hair and look unflattering. As long as feathers are placed lower down on your head, you can put them where ever you like. Buy feathers from a craft store instead of trying to find some outside. Way more sanitary! A small decorative clasp or hair comb. 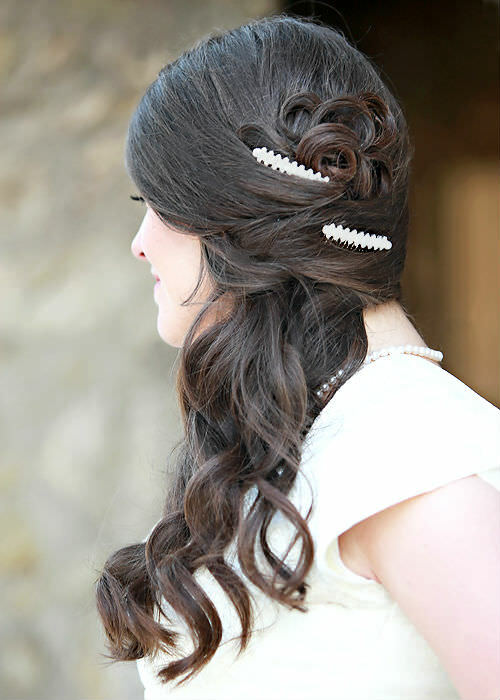 Barrettes are small enough to go in a sleek bridal hairstyle. They also go well with really elaborate or intricate updos since they are small and won’t take away from your hairstyle. Avoid placing barrettes in a straight line or row. Try to scatter them a little. Barrettes are great for hiding bobby pins. If there are bobby pins showing on the sides or in the front of your hairstyle, cover them with a barrette. 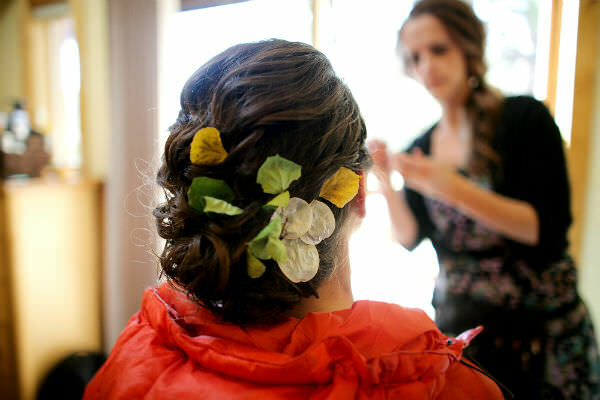 Real or fake flowers can be used in bridal hairstyles. You can use one, two, or as many as you’d like. 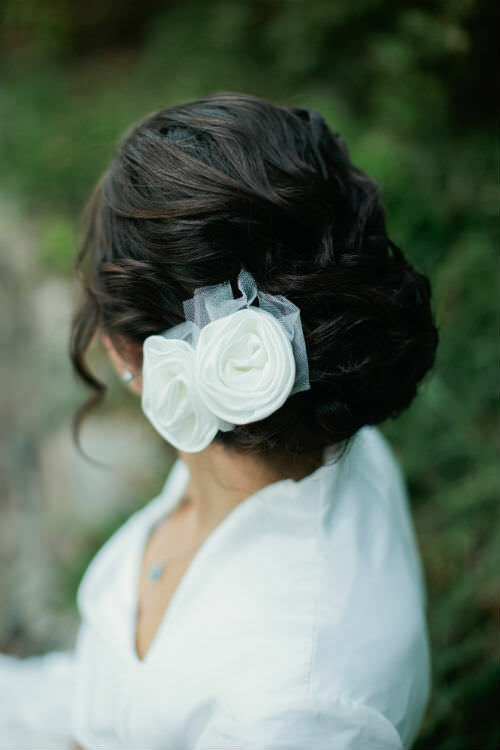 Flowers can go into any bridal hairstyle that has volume. Flowers in a flat style will look too large and throw off the balance of the overall look. Flowers look best right next to an updo. Since they add more volume to your hair, try to leave a spot for them in your updo so they fit in nicely. If you are using real flowers, DON’T hairspray your hair after they are in. Spray before! Hairspray will kill your flowers and they will wilt by the end of the day. A semicircular jeweled hair piece. Tiaras go best with a half up or an all up hairstyle. Since they are heavy and sit on top of your head, they can often be too much for an all down style. The shape of a tiara fits an updo nicely. A tiara typically goes directly on top of your hair, worn like a crown, or framing an updo. Try to find a tiara that’s a little flexible. Everyone’s head shape and size is different, so it’s nice if you can bend the tiara a little to fit your head shape. 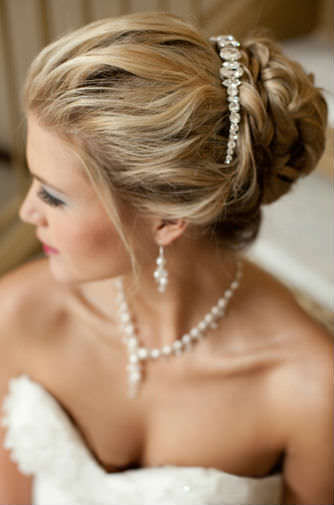 Whatever you decide to go with, use your bridal hair accessory as an opportunity to showcase your personality and style. Think outside of the box and have fun with it!